HTML5 has been criticised for not having a timing model of the media resource in its new media elements. This article spells it out and builds a framework of how we should think about HTML5 media resources. Note: these are my thoughts and nothing offical from HTML5 – just conclusions I have drawn from the specs and from discussions I had. What is a time-linear media resource? In HTML5 and also in the Media Fragment URI specification we deal only with audio and video resources that represent a single timeline exclusively. Let’s call such Web resources a time-linear media resource. The resource can potentially consist of any number of audio, video, text, image or other time-aligned data tracks. All these tracks adhere to a single timeline, which tends to be defined by the main audio or video track, while other tracks have been created to synchronise with these main tracks. This model matches with the world view of video on YouTube and any other video hosting service. It also matches with video used on any video streaming service. I’ve deliberately chosen the word “time-linear” because we are talking about a single, gap-free, linear timeline here and not multiple timelines that represent the single resource. The word “linear” is, however, somewhat over-used, since the introduction of digital systems into the world of analog film introduced what is now known as “non-linear video editing”. This term originates from the fact that non-linear video editing systems don’t have to linearly spool through film material to get to a edit point, but can directly access any frame in the footage as easily as any other. When talking about a time-linear media resource, we are referring to a digital resource and therefore direct access to any frame in the footage is possible. So, a time-linear media resource will still be usable within a non-linear editing process. As a Web resource, a time-linear media resource is not addressed as a sequence of frames or samples, since these are encoding specific. Rather, the resource is handled abstractly as an object that has track and time dimensions – and possibly spatial dimensions where image or video tracks are concerned. The framerate encoding of the resource itself does not matter and could, in fact, be changed without changing the resource’s time, track and spatial dimensions and thus without changing the resource’s address. The term “time-linear” is used to specify the difference between a media resource that follows a single timeline, in contrast to one that deals with multiple timelines, linked together based on conditions, events, user interactions, or other disruptions to make a fully interactive multi-media experience. Thus, media resources in HTML5 and Media Fragments do not qualify as interactive multimedia themselves because they are not regarded as a graph of interlinked media resources, but simply as a single time-linear resource. In this respect, time-linear media resources are also different from the kind of interactive mult-media experiences that an Adobe Shockwave Flash, Silverlight, or a SMIL file can create. These can go far beyond what current typical video publishing and communication applications on the Web require and go far beyond what the HTML5 media elements were created for. If your application has a need for multiple timelines, it may be necessary to use SMIL, Silverlight, or Adobe Flash to create it. In this way, time-linear media resources can contribute towards an interactive multi-media experience, created by a Web developer through a combination of multiple media resources, image resources, text resources and Web pages. The limitations of this approach are not yet clear at this stage – how far will such a constructed multi-media experience be able to take us and where does it become more complicated than an Adobe Flash, Silverlight, or SMIL experience. The answer to this question will, I believe, become clearer through the next few years of HTML5 usage and further extensions to HTML5 media may well be necessary then. At this stage, however, we have already determined several limitations of the existing HTML5 media elements that require resolution without changing the time-linear nature of the resource. Above all, there is a need to expose the above painted structure of a time-linear media resource to the Web page. Right now, when the <video> element links to a video file, it only accesses the main audio and video tracks, decodes them and displays them. The media framework that sits underneath the user agent (UA) and does the actual decoding for the UA might know about other tracks and might even decode, e.g. a caption track and display it by default, but the UA has no means of knowing this happens and controlling this. We need a means to expose the available tracks inside a time-linear media resource and allow the UA some control over it – e.g. to choose whether to turn on/off a caption track, to choose which video track to display, or to choose which dubbed audio track to display. I’ll discuss in another article different approaches on how to expose the structure. Suffice for now that we recognise the need to expose the tracks. A HTML page is a sequence of HTML tags delivered over HTTP to a UA. A HTML page is a Web resource. It can be created dynamically and contain links to other Web resources such as images which complete its presentation. We have to move to a similar “virtual” view of a media resource. Typically, a video is a single file with a video and an audio track. But also typically, caption and subtitle tracks for such a video file are stored in other files, possibly even on other servers. The caption or subtitle tracks are still in sync with the video file and therefore are actual tracks of that time-linear media resource. 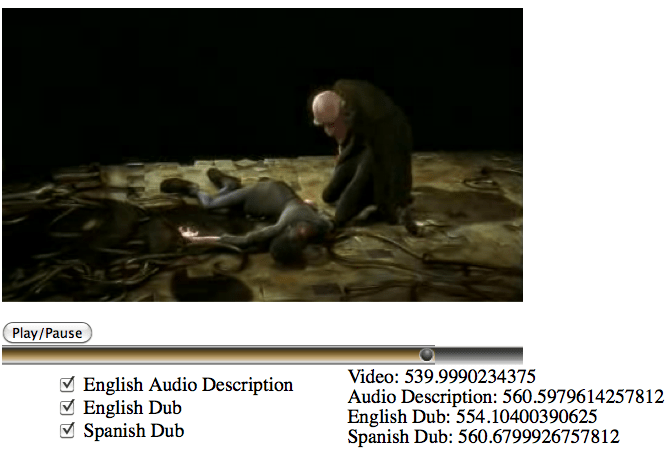 There is no reason to treat this differently to when the caption or subtitle track is inside the media file. When we separate the media resource concept from actual files, we will find it easier to deal with time-linear media resources in HTML5. A time-linear media resource, when regarded completely abstractly, can contain all sorts of alternative and additional tracks. For example, the existing <source> elements inside a video or audio element are currently mostly being used to link to alternative encodings of the main media resource – e.g. either in mpeg4 or ogg format. We can regard these as alternative tracks within the same (virtual) time-linear media resource. Similarly, the <source> elements have also been suggested to be used for alternate encodings, such as for mobile and Web. Again, these can be regarded as alternative tracks of the same time-linear media resource. Another example are subtitle tracks for a main media resource, which are currently discussed to be referenced using the <itext> element. These are in principle alternative tracks amongst themselves, but additional to the main media resource. Also, some people are actually interested in displaying two subtitle tracks at the same time to learn translations. Another example are sign language tracks, which are video tracks that can be regarded as an alternative to the audio tracks for hard-of-hearing users. They are then additional video tracks to the original video track and it is not clear how to display more than one video track. Typically, sign language tracks are displayed as picture-in-picture, but on the Web, where video is usually displayed in a small area, this may not be optimal. As you can see, when deciding which tracks need to be displayed one needs to analyse the relationships between the tracks. Further, user preferences need to come into play when activating tracks. Finally, the user should be able to interactively activate tracks as well. Once it is clear, what tracks need displaying, there is still the challenge of how to display them. It should be possible to provide default displays for typical track types, and allow Web authors to override these default display styles since they know what actual tracks their resource is dealing with. While the default display seems to be typically an issue left to the UA to solve, the display overrides are typically dealt with on the Web through CSS approaches. How we solve this is for another time – right now we can just state the need for algorithms for track activiation and for default and override styling. To make media resources a prime citizens on the Web, we have to go beyond simply replicating digital media files. The Web is based on hyperlinks between Web resources, and that includes hyperlinking out of resources (e.g. from any word within a Web page) as well as hyperlinking into resources (e.g. fragment URIs into Web pages). To turn video and audio into hypervideo and hyperaudio, we need to enable hyperlinking into and out of them. With such addressing schemes available, there is still a need to hook up the addressing with the resource. For the temporal and the spatial dimension, resolving the addressing into actual byte ranges is relatively obvious across any media type. However, track addressing and named addressing need to be resolved. Track addressing will become easier when we solve the above stated requirement of exposing the track structure of a media resource. The name definition requires association of an id or name with temporal offsets, spatial areas, or tracks. The addressing scheme will be available soon – whether our media resources can support them is another challenge to solve. Finally, hyperlinking out of media resources is something that is not generally supported at this stage. Certainly, some types of media resources – QuickTime, Flash, MPEG4, Ogg – support the definition of tracks that can contain HTML marked-up text and thus can also contain hyperlinks. But standardisation in this space has not really happened yet. It seems to be clear that hyperlinks out of media files will come from some type of textual track. But a standard format for such time-aligned text tracks doesn’t yet exist. This is a challenge to be addressed in the near future. With the new media elements in HTML5, this is no different. So far, the most basic need has been satisfied: that of including simple video and audio files into Web pages. However, many basic requirements are not being satisfied yet: accessibility needs, codec choice, device-independence needs are just some of the core requirements that make it important to extend our view of <audio> and <video> to a broader view of a Web media resource without changing the basic understanding of an audio and video resource. This post has created the concept of a “media resource”, where we keep the simplicity of a single timeline. At the same time, it has tried to classify the list of shortcomings of the current media elements in a way that will help us address these shortcomings in a Web-conformant means. If we accept the need to expose the structure of a media resource, the need to separate the media resource concept from actual files, the need for an approach to track activation, and the need to deal with styling of displayed tracks, we can take the next steps and propose solutions for these. Further, understanding the structure of a media resources allows us to start addressing the harder questions of how to associate events with a media resource, how to associate a navigable structure with a media resource, or how to turn media resources into hypermedia. As part of my experiments in video accessibility I am also looking at the audio element. I have just finished a proof of concept for parsing Lyrics files for music in lrc format. The demo uses Tay Zonday’s “Chocolate Rain” song both as a video with subtitles and as an audio file with lyrics. Fortunately, he published these all under a creative commons license, so I was able to use this music file. BTW: I found it really difficult to find a openly licensed music file with lyrics. While I was at it, I also cleaned up all the old demos and now have a nice list of all demos in a central file.